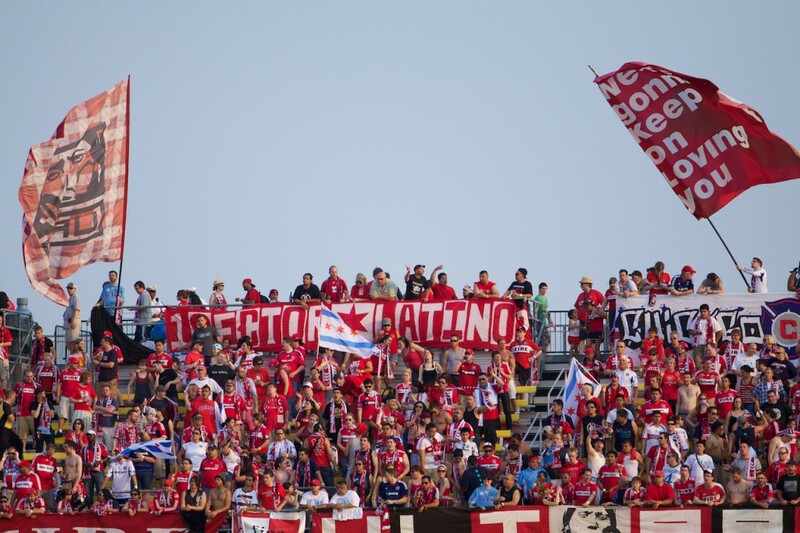 BRIDGEVIEW, Ill. – After a long break, the U.S. Open Cup has returned, as the last remaining non-MLS team in the competition looks to continue their Cinderella story against the Chicago Fire in the quarterfinal round of this historic tournament. 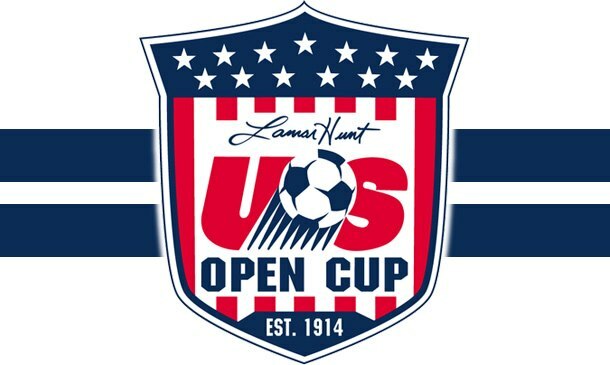 For those unfamiliar with the American professional soccer scene, the Lamar Hunt U.S. Open Cup is a single-elimination tournament where virtually all amateur and professional soccer teams in the United States have an opportunity to compete for America’s national championship. The winning team receives a $250,000 cash prize and an automatic berth in the CONCACAF Champions League, a competition that determines the best team in North & Central America. The importance of this competition cannot be understated, as it affords even the lowest soccer teams in the country the opportunity to compete against the largest and most successful clubs America has to offer. It is the third-oldest domestic soccer competition in history. Let’s start with the visitors – the Fort Lauderdale Strikers. If that name sounds familiar, it’s because this team bears the same name as the old “Fort Lauderdale Strikers” that played against the likes of George Best and Pele in the North American Soccer League during the 1970’s and 1980’s. Interestingly, this current incarnation of the Strikers also plays in the NASL; however, this incarnation is a second-division league that has no relation with the original league. The Strikers have had a difficult road to this stage in the competition, having to beat MLS mainstays D.C. United on penalties during the Fourth Round before upsetting MLS newcomers Orlando City SC by a 2-1 margin on June 20th. During league play, the Strikers have not been nearly as successful, as they currently sit in eighth place and well out of the NASL Playoffs. 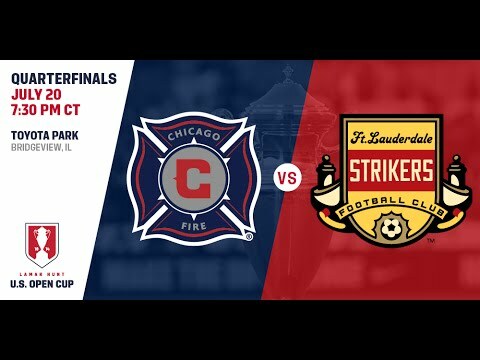 The Fire have played two matches in this year’s U.S. Open Cup, needing penalties to defeat NASL side Indy Eleven in the Fourth Round and taking care of Eastern Conference rival Columbus Crew SC in the Round of 16. 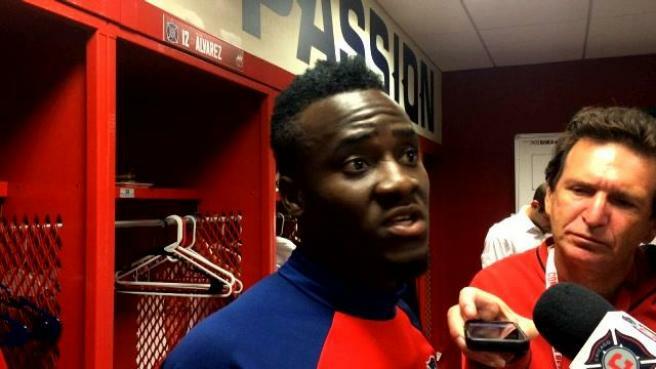 David Accam scored three goals in two Open Cup matches prior to tonight’s match. David Accam was a man on a mission during the first half, as he put the ball in the back of the net on a PK during the fifth minute of play before setting up newly-acquired forward Michael de Leeuw for an easy touch into the goal to give Chicago a comfortable 2-0 lead at the halftime break. On the visiting side, the Strikers were plagued by a lack of discipline, as a 30th-minute yellow card and a silly foul from the keeper led to the Fire seizing control of this match right from the start. The second half was kicked off by 22-year old midfielder Khaly Thiam, who netted his first Open Cup goal and just his second in a Fire shirt with a rebound in the 51st minute. Thiam joined the Fire on loan from Hungarian first-division club MTK Budapest FC and has proven invaluable during his short time in the Windy City. The Strikers’ day got worse in the second half, as Gale Abossoumonde was shown his second yellow in the 70th minute, putting his team a man down for the remainder of the contest. Even though they lost this match, the Strikers can leave with their heads held high – and a $15,000 check courtesy of the United States Soccer Federation. As for the Fire, they advance to a semi-final contest on August 10th, where they will take on fellow Eastern Conference bottom dwellers New England Revolution. The winner of that match will take on the winner of the other semi-final, which features the LA Galaxy and FC Dallas. The Strikers return to NASL play on Saturday when they host Minnesota United FC, while Chicago will look to carry their momentum into MLS play when they host USMNT star midfielder Lee Nguyen and the New England Revolution this Saturday night at Toyota Park. One of the most heartbreaking finishes in the 2016 Major League Soccer season came on Saturday night at Toyota Park, when Impact midfielder Ignacio Piatti put the ball in the back of the net with just seconds remaining in stoppage time to give the Eastern Conference-leading Montreal Impact a 2-1 victory over the Fire. The Fire snatched a 1-0 lead in the 29th minute when team scoring leader Kennedy Igboananike took a Gilberto pass and turned it into a perfect finish past Impact goalkeeper Evan Bush, ending the Fire’s three game scoring drought. Going into halftime, the Fire maintained that 1-0 lead; however, the tide would turn with the entrance of Ivorian superstar Didier Drogba for the Impact. Drogba’s impact (pun intended) was felt almost immediately when he scored his first goal of the season 10 minutes into the second half. The match went back and forth through most of the second half until the previously mentioned goal from Piatti was put past Fire goalkeeper Matt Lampson after time had expired and stoppage time was almost complete. I got a unique perspective of Saturday’s match, standing with the notoriously rowdy supporters group, Sector Latino. This group is small, but they are welcoming and always standing and cheering for the Men in Red. 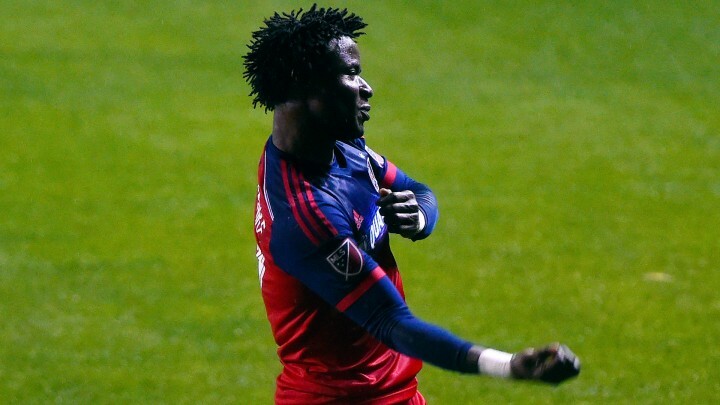 The Fire are off this week before hosting Eastern Conference foe D.C. United next Saturday at Toyota Park, while Montreal look to stay atop the Eastern Conference standings with a showdown versus Canadian rivals Toronto FC next Saturday. The Chicago Fire picked up its first win of the 2016 regular season with a 1-0 victory over longtime Eastern Conference rival Philadelphia Union on Saturday afternoon. The victory marked the second consecutive shutout for the Fire, as well as Veljko Paunovic’s first win as Fire head coach. The match got off to a slow start, as the first half ended with neither team scoring a goal. Union midfielder Warren Creavalle was shown a yellow card at the 13th minute. This yellow card proved costly, as he was shown a second yellow card at the 47th minute and was promptly sent off. That was not the only yellow card that was shown in the first half, as Brazilian U-20 star and Chicago defender Rodrigo Ramos was also booked in the 37th minute. Just five minutes after Creavalle was ejected from the match, Fire striker and Nigerian international Kennedy Igboananike took a pass into the box and turned it into a beautiful finish to the far post, giving the Fire a 1-0 lead. Igboananike almost scored a second time in the 66th minute, but was called “offside” just as the ball hit the net. The Union would not give up hope of a comeback, as Union players fired nearly 20 shots at Fire goalkeeper Matt Lampson; however, only three of those shots were on-target, and all three ended up safely in the hands of Lampson. Lampson recorded his second clean sheet in his first season in Chicago, while rookie center back Jonathan Campbell has led one of Major League Soccer’s best defensive units – the Fire have allowed just one goal in its past three matches. An area to improve for the Fire would be at the forward position – Chicago has scored twice in three matches, as the Fire have been kept in games largely through the efforts of the club’s stout defensive play. The Chicago Fire will look to keep their three-match unbeaten streak alive as they travel to the Big Apple to take on second-year side New York City FC at historic Yankee Stadium. That match will be televised live on Fox Sports 1, with kickoff scheduled for April 10th at 7PM. The Union will return to Philadelphia for a Friday night showdown against another second-year side in Orlando City SC. Tom Cleverley has agreed to join Everton on a five-year deal. The 25 year-old will move to Goodison Park on a free transfer when his current contract with Manchester United expires on July 1st. Cleverley spent last season on loan at Aston Villa and played in last week’s FA Cup Final defeat to Arsenal. The midfielder also has 13 England caps to his name. The move to Merseyside will see Cleverley reunited with Toffees manager Roberto Martinez, after the pair worked together at Wigan Athletic. Martinez told Sky Sports: “We are extremely delighted to be welcoming Tom to Everton and I can think of many reasons as to why our fans will enjoy Tom representing our football club. “The most important one is that he is a perfect fit for what we are trying to build here as he has so much experience of playing in the Premier League and he still has his best years just ahead of him. “At the age of 25 and a player who is representing his country, Tom has experienced winning trophies and having big roles in demanding teams. Having worked with him previously, I know the type of character he is and I know that, with the Everton fans’ support, we will get a very special footballer joining our already exciting team.